Here in the Kim household, we see a lot of gadgets during Christmas. We give and receive brand new gadgets. We donate or recirculate gently used gadgets that are in good shape. We'll even collect some together and put them on eBay. This year, I got a Dell Venue 8 Pro to replace my iPad mini and my iPad mini went to someone else (although the kids will probably still be the ones mainly using it during long car rides). The Venue 8 Pro is a Windows 8.1 tablet PC that is very thin and light. At a glance, it resembles an iPad mini because it has an 8" display. However, this is a full Windows PC that runs all my enterprise applications. Plus, the microSD expansion slot gives me plenty of storage space so that I can carry all my critical work files and remain productive when I'm on the road. The iPad mini is a great device for email, web browsing, and apps. But, if you're trying to maintain productivity, it has its limitations. On my iPad mini, my most commonly used apps were Evernote and Penultimate. I'd jot down notes by writing directly on the screen and I'd retrieve my hand-written notes from my PC. With the Dell Venue 8 Pro, I can write an Ink Note directly on the Evernote application and retrieve and edit it easily from a PC. I can also switch to OneNote or another pen-based application. Medical students who like to hand-write notes will appreciate the features that OneNote offers. The stylus pen on the Venue 8 Pro is sold separately and has been updated to improve performance compared to earlier pens. 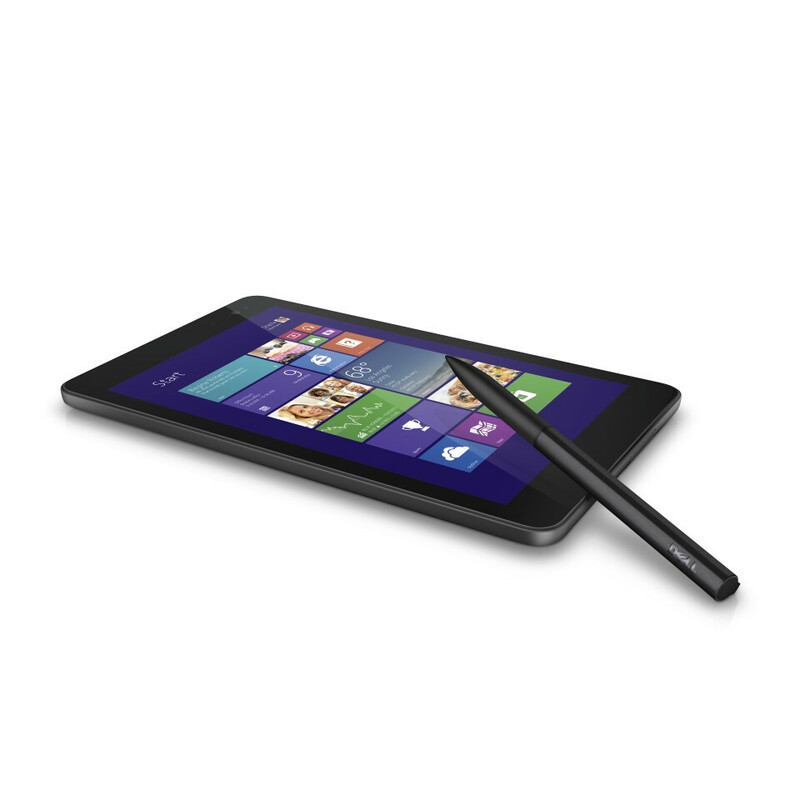 So for 2014, the Dell Venue 8 Pro will be my main mobile tablet. I'll continue to carry a Bluetooth keyboard and use a stylus pen to jot notes. The best thing about the Venue 8 Pro is that it will be set up to be identical to my desktop workstation. This means that all my Windows-based desktop applications and files will be at my fingertips. I will run a full version of Microsoft Office, but a "limited-feature" version that's designed for iOS. I'll have all my Outlook data with me. Dell has bundled the full version of Microsoft Office Home and Student 2013 (normally priced at $139.99) into the price of the Dell Venue 8 Pro. You'll have to be comfortable reading off a smaller 8" screen if you plan to use the Dell Venue 8 Pro or any other high-definition 8" tablet. You also need to get accustomed to the Windows 8 experience if you've never used Windows 8. The interface is quite different, but after you use it for a while, you'll quickly get the hang of it. You may want to change your Windows settings to increase font size, the size of your scroll bars, and other visual elements to minimize pinch-to-zoom since the traditional Windows desktop is not optimized for touch. Don't get the Venue 8 Pro with the Venue 8. The Venue 8 Pro runs Windows 8.1. The Venue 8 runs Android. I find the naming convention a bit confusing since they are both called Venue 8, but one runs an enterprise operating system and the other runs Android. The question that I get most is this: is the 3rd generation Atom processor (Z3740D) powerful enough to provide a good Windows 8.1 experience? My answer is: Yes. Compared to the 2nd generation Atom processors that we saw in earlier Windows 8 tablets, the Quad-Core Z3740D performs very nicely for business applications plus you still get all-day battery life. Here's my personal tip if you plan to get the Venue 8 Pro: go with the 64 GB model, not the 32 GB model. You'll want that space to load business applications. If you're buying the device purely as an entertainment tablet, then 32 GB should be fine. However, if you plan to use it professionally, you'll want more space. Finally, keep in mind that mobile apps for Windows 8 still remain somewhat limited. So, if you're a big fan of certain mobile apps that are found on iOS or Android, you'll want to check to see if those apps are also available for Windows 8. If you can't live without your popular gaming app, then you won't be happy with Windows 8.